Week Commencing 24th September 2018..
Holly's number has three tens and five ones. What number does Holly have? Ravi's number has two tens more than Holly's number. What number does Ravi have? Charles rounds the number 873,283 to the nearest hundred. He writes down: 874,200. Is he correct? Can you explain your answer using what you know about place value. Week Commencing 17th September 2018.. I am thinking of a number. It is an even number. The digit in the tens column is greater than 4. What number could it be? HINT: There is more than one possible answer. You have two sets of the digits from 0 to 9. 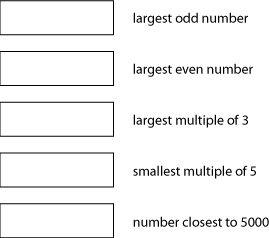 Can you choose some of the numbers to arrange four digit numbers to meet the target statements? You can only use each digit once.